Alberta is being bailed out because it has been all but giving away its?provincially owned oil and gas natural resources for decades when compared to other countries.? But Albertans and Canadians suffer in terms of revenue generated for government in?comparison to virtually all other oil and gas producers, even notoriously corrupt regimes. Canada?taxes its oil and gas companies at a fraction of the rate they are taxed abroad, including by countries ranked among the world’s most corrupt, according to an analysis of public data by the Guardian.? Chevron used to run its Nigeria and Indonesia projects out of the U.S., but after?allegations?that they evaded billions in taxes, their operations were moved to Canada. While royalty rates in Newfoundland are the highest in Canada, in Alberta they have?fallen?from a 40 per cent high during the 1970s to less than four per cent, and a complex system of exemptions ensures companies often pay even less. The NDP government in Alberta backed away from a pledge to hike them. Meanwhile, as the world continues to hurdle towards global warming catastrophe, Canada's greenhouse gas emissions continue to grow while the federal Liberal government proclaims there is nothing to worry about as we will meet our 2030 emissions, after similar Liberal promises were broken in failing to meet our Kyoto and 2020 emission reduction commitments.? But even if all new carbon emissions were to end immediately, the earth would still warm over the coming decades, McBean said. ?So he says we need to start planning for that reality. More evidence arrives on an ongoing?basis now of how global warming is impacting Canada and the rest of the world. A?May ?2018?report concludes that glaciers in Western Canada are retreating at an unprecedented rate. As these glaciers melt they increase sea levels thereby creating flooding and massive bills associated with the resulting damage, as well as dams to reduce the effects. The loss of these glaciers also threaten to turn parts of?the already dry prairies into desert. Glaciers act as a bank account during hot summers when water is scarce, he added. ?The melt also changes the way water flows and where it accumulates, creating lakes, wetlands or desert-like conditions. ?“In some places you’ll have locally increased water availability and in many, many, many places that water availability will be reduced as well,” Prof. Hik said. ?The changes alter the flora of the area. Tree lines are moving up the slope, and willows and birches – water-loving species – are prospering at higher elevations, Prof. Hik said. The NDP BC government has made two decisions that counter each other in terms of dealing with climate change: the release of its?Clean BC Plan and its approval of LNG Canada.? The CleanBC plan divides all of B.C. 's emissions into three big groupings:?Industry,?Transportation, and?Buildings & Communities. The problem is that while the?Transportation, and?Buildings & Communities sectors are projected to reach their 2030 target reductions of 40% below 2007 levels, the Industry sector is expected to increase, with the LNG projects being the main contributor to the growing greenhouse gas emissions. Furthermore, these projections do not include two other LNG projects, Woodfibre and Kwispaa LNG, that are currently pushing to also get approval. If these two additional LNG projects are approved, they would increase emissions another 50%.? In other words, industry is being let off the hook, even though it is the primary polluter while communities and individuals will bear the burden of the greenhouse gas reduction costs.? The LNG Canada project is massive. It will sprawl from new fracked gas wells in northern B.C., across the coast mountains via the hotly-contested, 650 km? "Coastal GasLink"?pipeline, to a new liquefaction terminal in Kitimat. From there, the gas will be loaded onto supertankers and shipped to Asia. The LNG terminal is designed to be built in?two phases, each of which will produce 13 million tonnes of liquid natural gas. The first phase is now going ahead. If both phases get built it will become the? "biggest capital project in B.C. history. "?And probably the most climate polluting as well, with projections for up to 10 million tonnes of climate pollution (MtCO2) per year. For scale, that's more than the emissions from all passenger cars, trucks and SUVs in the province today. First, the good news: CleanBC is expected to get two sectors close to the province's 2030 climate goal. ?The best performer is the Buildings & Communities sector shown by the dashed green line. With CleanBC policies, this sector is projected to cut its climate pollution even faster. It's expected to end up a bit below (i.e. : better than) the province's 2030 target. ?The biggest change in direction is in Transportation, shown by the blue dashed line. Under CleanBC policies, this sector's emissions are projected to start falling. By 2030 the government expects them to end up close to the provincial target. Assuming LNG Canada is the only project approved, the chart's orange zone shows the potential range for Industry depending on whether phase two gets built. ?When it comes to calculating the project's benefits, the government uses numbers that assume phase two will be built — $40 billion in spending and $22 billion in revenue. But when it comes to calculating the climate pollution, and what to do about it, the government uses numbers that assume phase two will not be built. A Prius Prime is our new ride. I went 1500 km on my last 36 liter tank. It didn't cost anymore than other mid-sized sedans and less than most of the small SUV's that everyone loves.? Toyota advertises 40 km of electric driving on a fully charged battery.? Most of the driving in the Valley I live in comes in under that but since it also has a gas engine I can still take it down Island. In hybrid mode for road trips it uses about 4.4 liters per 100 kms.? For old school folks that translates to over 60 miles per gallon on the freeway doing at least the speed limit. Much of the argument advanced in support of expanding?Canada’s fossil fuel production centres on job creation and economic benefits. ?Politicians, pundits and corporate spokespeople who support fossil fuel infrastructure projects—such as new oil and gas pipelines—often evoke this rhetoric when they appear in the media. Positioning themselves as friends of working people, they frame climate action as antithetical to the more immediately pressing need to protect oil and gas workers’ livelihoods. And as this study confirms, this framing has become dominant across the media landscape.
? There are substantial differences between mainstream and alternative media coverage. For instance, the mainstream media stories in the sample give more attention to fossil fuel industry organizations, while the alternative stories more often mention Indigenous people and environmental groups and protesters. In terms of themes, the mainstream stories more often focus on the economic and employment benefits of pipelines, while alternative media feature pipeline-critical themes.
? Although they tend to choose different sides, mainstream and alternative media both frequently reinforce the assumption that there is an inevitable trade-off between environmental protection and job creation.
? Themes that challenge this dominant narrative appear only infrequently. For example, the economic risks of pipeline development garner relatively little media attention, and the environmental concerns of energy sector workers and unions are rarely heard. The four NGOs say they’ll go to court if the government doesn’t meet a stringent deadline for responding to the petition. “If in two months we don’t have an answer from the French government, or if we are not satisfied by the answer, then we can go to the administrative court to ask judges to order it to do more to tackle climate change,” said Greenpeace France Executive Director Jean-Fran?ois Julliard. 2018 was another year of intensifying extreme weather around the world.? 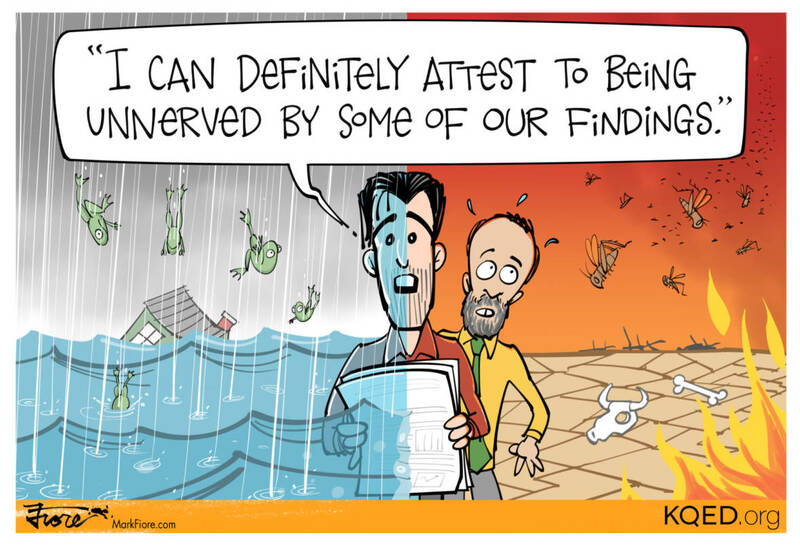 the global scientific consensus is that climbing temperatures, rising sea levels, and shifting atmospheric dynamics are already raising the probability that extreme weather events will be more frequent, more severe, and more deadly. ?Four notable trends made themselves felt in 2018. I. Wide Temperature Swings and a Changing Jet Stream: The winter of 2018 was the?warmest on record?in the Arctic, which is warming twice as fast as the global average. Scientists say this has contributed to dramatic temperature variations elsewhere, including record-setting extremes of both heat and cold. ?January saw record low temperatures from Toronto to Virginia, accompanied by a massive bomb cyclone that formed as cold arctic air met warmer air farther south, covering the entire Eastern Seaboard. II. Prolonged Heatwaves and Intensifying Wildfires: ?Around the world, temperature records were broken, including record highs of 120°F near Los Angeles in July. Japan recorded a?national record high?of 106°F, with the sustained heat killing dozens of people. Oman experienced what is likely the?highest minimum temperature?ever recorded anywhere, with temperatures never dropping below 108°F for several days straight. III. Rising Ocean Temperatures, Intensifying Storms:?Early in the year,?torrential downpours?in Southern California, driven by unusual atmospheric rivers of moisture, caused flooding and mudslides. The Atlantic hurricane season later produced several unprecedented storms, which caused major damage and loss of life on the U.S. East Coast. September’s Hurricane Florence?dumped thirty-five inches of rain?over parts of the Carolinas. In October, Hurricane Michael hit the Florida Panhandle as a Category 4, becoming the?strongest storm ever to make landfall?in the region. Oceans are absorbing?over 90 percent of the increased atmospheric heat. Climate scientists say this is likely making storms bigger and wetter. Warmer water means more energy in the storm system and more moisture in the air, making increased extreme precipitation?one of the most confident findings?of climate research. Several widely cited academic studies suggest that?climate change boosted the rainfall totals?of some previous hurricanes by more than 20 percent. ...?some initial expert assessments of Florence estimate that its?rainfall was 50 percent?greater than it would have been without warming. Moreover, rising sea levels increase storm surge, or the amount of water pushed inland by powerful storms, worsening the effects of flooding.? IV. Drought, Crop Failure, and Famine: In South Africa, a multiyear drought?came to a head?in Cape Town, nearly forcing officials to cut off water to four million people. In East Africa, several years of extreme drought and poor harvests have caused more than ten million people to face?acute water shortages?and potential famine. In the spring of 2018, meanwhile,?torrential rainfall?and record-setting flooding there displaced hundreds of thousands of people and further devastated farmland. In the United States,?drought conditions intensified in April?and covered nearly the entire southwest by summer. Arizona, Colorado, Missouri, New Mexico, and Utah reached what the U.S. government considers “exceptional drought” levels, subjecting tens of millions of people to dangerous heat,?reducing crop yields, and threatening water supplies. 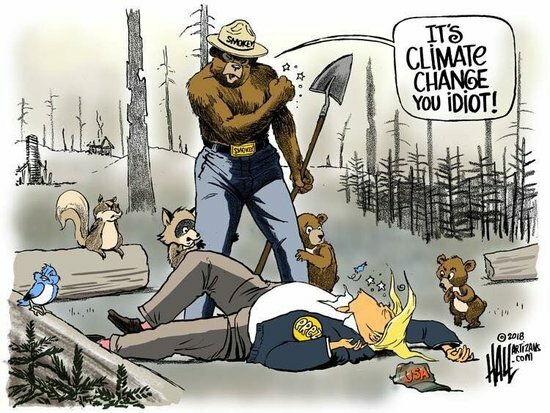 The U.S. National Climate Assessment, issued by thirteen federal agencies every four years,?updated its outlook?in November, concluding that warming would cost the United States at least 10 percent of its gross domestic product by 2100. Most economies around the world measure the economic conditions by means of GDP (gross domestic product). However, this economic sum of all the goods and services of a country does not take into account the effects of climate change, or the distribution of economic wealth. It does not take into account the damage done by climate change as noted in a May 2018 report.? We’ve known for years that the average temperature of a country influences its economy. Biologically, many profitable crops?function best?at cool temperatures. Humans?also tend to work best?under mild temperatures. But of course, tropical areas are also more likely to be subject to the long-term economic consequences of violent European colonization. Countries that?will be most affected?by the fallout of climate change are already unfairly disadvantaged thanks to systemic factors that have nothing to do with their regular weather. There are alternatives to?GDP, which is a neoclassical economic measure, that take into account income distribution and environmental sustainablility. One of them is ISEW.? The?Index of Sustainable Economic Welfare? (ISEW) is an?economic?indicator intended to replace the?Gross Domestic Product, which is the main macroeconomic indicator of System of National Accounts (SNA). Rather than simply adding together all expenditures like the?gross domestic product,?consumer expenditure?is balanced by such factors as income distribution and cost associated with pollution and other unsustainable costs. It is similar to the?Genuine Progress Indicator (GPI). GDP is misleading as an indicator or even as a proxy of the welfare of a nation, let alone as a measure of people’s well-being,?although the makers of economic policy commonly think to the contrary. This problem already became apparent in practical economic policies in most?industrialised countries in the early 1970s. The most famous examples of this development are the MEW index developed by?William Nordhaus?and?James Tobin?in their?Measure of Economic Welfare (MEW)?in 1972, the Japanese Net National Welfare (NNW) indicator in 1973, the Economic Aspects of Welfare index (EAW) index of Zolatas in 1981, the ISEW indicator of Daly and Cobb in 1989 and the UN’s human development index, or HDI, in 1990. They are all based on neoclassical welfare economics and use as the starting point the System of National Accounts (SNA). The basic idea behind all these approaches is the inclusion of nonmarket commodities, positive and negative, to yield an aggregated macroindicator in monetary terms. Another measure that takes into account environmental as well as economic factors is the GPI.? Vermont?two years ago became the first state in the US to pass a law introducing a new metric for measuring economic performance and success. Genuine progress indicator? (GPI) is a?metric?that has been suggested to replace, or supplement,?gross domestic product?(GDP). The GPI is designed to take fuller account of the?well-being?of a nation, only a part of which pertains to the size of the nation's economy, by incorporating environmental and social factors which are not measured by GDP. For instance, some models of GPI decrease in value when the?poverty?rate increases. ?The GPI separates the concept of societal progress from?economic growth. The GPI is used in?ecological economics, "green" economics, sustainability and more inclusive types of economics. It factors in?environmental?and?carbon footprints?that businesses produce or eliminate, including in the forms of?resource depletion,?pollution?and long-term environmental damage. ?GDP is increased twice when pollution is created, since it increases once upon creation (as a side-effect of some valuable process) and again when the pollution is cleaned up; in contrast, GPI counts the initial pollution as a loss rather than a gain, generally equal to the amount it will cost to clean up later plus the cost of any negative impact the pollution will have in the mean time. While quantifying costs and benefits of these environmental and social?externalities?is a difficult task, "Earthster-type databases could bring more precision and currency to GPI's metrics. "?It has been noted that such data may also be embraced by those who attempt to "internalize externalities" by making companies pay the costs of the pollution they create (rather than having the government or society at large bear those costs) "by taxing their goods proportionally to their negative ecological and social impacts". While governments continue to take relatively small steps to deal with global warming, the atmosphere of the planet continues to both significantly increase both its carbon dioxide levels and its temperature. ?As carbon dioxide in the atmosphere hit a new record?according to the?European Union's Copernicus Climate Change Service, 2018 turned into the fourth warmest year globally on record. All four of the warmest years have occurred during the last four years, with 2016, an El Nino year, establishing the all-time record. According to the United Nations' World Meteorological Organization (WMO), there is 75-80% chance that December 2018 to February 2019 will produce another El Nino year, leading meterologist and climate scientist?Eric Holthaus to conclude:? The rising global atmospheric temperature once again had?major negative impacts around the world through a wide range of weather events. Last year was the fourth warmest on record, extending a scorching streak driven by a buildup of man-made greenhouse gases, the European Union's Copernicus Climate Change Service said on Monday. ?Average world surface air temperatures were 14.7 C?in 2018, just 0.2 C off the highest, it said in the first global assessment based on full-year data. This year will also likely be hot, its scientists said. The last four years have seen the highest average temperatures since records began in the 19th century —?2016 was the hottest, boosted by an El Nino event that warmed the surface of the Pacific Ocean, ahead of 2017 and then 2015.?The Copernicus report said that concentrations of heat-trapping carbon dioxide in the atmosphere rose to a new record of 406.7 parts per million (ppm) in 2018 from 404.1 in 2017, stoked largely by human burning of fossil fuels. And the average global temperature in the past five years was 1.1 C?above pre-industrial times, it said. ?According to a UN?climate report last year, temperatures will rise 1.5 C above pre-industrial times by mid-century on current trends —?bringing the prospect of even more extreme weather. The Copernicus report confirms projections by the UN's World Meteorological Organization (WMO) in November that 2018 would be fourth warmest. ?The WMO will issue its own estimate for 2018 temperatures in coming weeks, also comprising data compiled by U.S., British and Japanese agencies. David Suzuki has spoken out once again about the failure of Canadian governments to deal the existential crisis created by?global warming and its impacts on all forms of life.? Here in Canada, politicians claim to take climate change seriously but reject plans to mitigate it without offering better alternatives. Some provincial and federal leaders are governing or building campaigns around?rejection of carbon pricing, a proven tool for reducing greenhouse gas emissions. It's interesting, because carbon pricing is a market-based strategy, whereas the kind of government regulation that would be required in its absence is something conservative thinkers usually reject. To be fair, few politicians are emerging as climate heroes, regardless of where they sit on the political spectrum. Our federal government has some good climate policies, including carbon pricing, but is still pushing for pipelines and oilsands expansion. It's even?watered down carbon-pricing plans?to appease industry. Ponteverde Spain is an example of a city that has went a long way towards making its urban habitat more livable while reducing its greenhouse gas emissions at the same time.? The following video shows temperature anomalies by country (how much warmer or cooler each country was than the average temperature) each year from 1880 to 2017 with the increasing frequency of red for warmer become totally dominant as the year approaches to 2017.? A new analysis released this week by Science magazine shows that the Earth's oceans are warming 40% faster than predicted by the United Nations Intergovernmental Panel on Climate Change just five years ago, showing that global warming is accelerating with dire consequences for the planet and humans.? The oceans are heating up all right. In fact, the Earth’s oceans are warming 40% faster than that UN panel predicted, according to new analysis published Thursday in the journal?Science. About 93% of the greenhouse gasses humans emit are trapped by the oceans, which serve as a vital buffer as carbon emissions continue to climb despite warnings that we’re causing irreversible destruction to the planet. And warming oceans lead to a lot of other dire consequences, some immediately felt by humans and other creatures, and some more generally destructive to life as we’ve long known it. The?Science?study sums up some of the catastrophic impacts of warming oceans in one alarming list, which includes “rainfall intensity, rising sea levels, the destruction of coral reefs, declining ocean oxygen levels, and declines in ice sheets; glaciers; and ice caps in the polar regions.” In the Arctic, the warming oceans are also causing?a serious decline in sea ice, which only compounds the ongoing threats of climate change such as sea level rise. Climate change isn’t just bad for all living creatures. It also happens to be?bad for the economy, with consequences ranging from collapsing coastal real estate values to the rising cost of food production and distribution in areas once fertile for farming but now in decline due to new weather patterns and extreme weather. 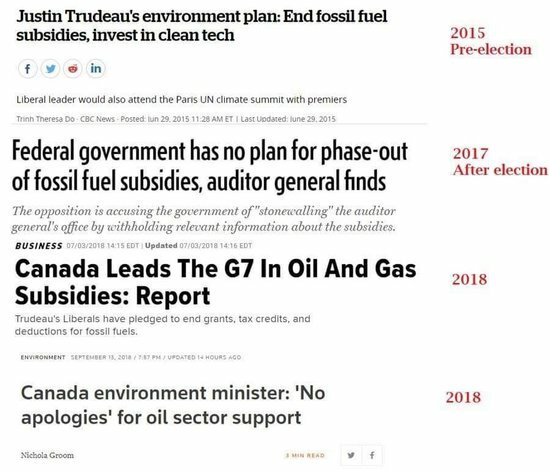 ?Justin Trudeau’s certainly not taking on the fossil fuel industry, nor is he transforming our energy system away from fossil fuels. ...?In fact you’d be hard-pressed to find a politician in Canada, or anywhere in the world for that matter, with the exception of Sanders, soon-to-be New York State Congresswoman Alexandria Ocasio-Cortez, and a handful of others, who are advocating for what clearly needs to be done — get our society off fossil fuels – and fast! ...?Big Oil’s vast power and influence over politicians and how this is augmented by the critical backing of neoliberal ideology, which limits the range of possible global warming responses to market solutions. As a result, Big Oil and neoliberal think tanks have blocked action on climate change in Canada and around the word for 30 years. And they’re still doing it. ?we need to achieve zero-carbon in 32 years, because if we don’t, the average global temperature will break the 1.5 degree limit that’s considered to be relatively safe. ?But only relatively safe. We’re already up slightly more than one degree since the beginning of the industrial era in 1750 and we can see the enormous negative impacts of this increase. We’ve got to get Big Oil and neoliberalism off our backs. The solutions they offer—carbon taxes, cap and trade, clean growth, a low—not zero—carbon future—will never get us where we need to be. ?We’ve been living with market solutions to global warming for two decades and the dial continues to move in the wrong direction. While the Liberals and Conservatives continually promote jobs in the fossil fuel industry, this industry creates few jobs per dollar invested compared to renewables and?fossil fuel sector employment has been in decline globally for more than five years while renewables have been the fastest growing sector in terms of employment. Furthermore, Trudeau has inflated both the number of construction and permanent jobs involved in the Trans Mountain pipeline.? Kinder Morgan has projected 50 direct full-time jobs once the?pipeline is up and running. "The Kinder Morgan expansion project is all risk and no gain for the public or our environment," said?Joie Warnock, Unifor's Western Director. "Despite applying conditions for approval, in the absence of any realistic, enforceable regulations, the NEB failed to consider the very serious risks a project of this magnitude has for residents and our economy." While Canada continues to pour more and more money into the fossil fuel sector, the rest of the world is shifting to renewables both in terms of investments and jobs, including the world's biggest economies, leaving Canada in danger of being an economic dinosaur.? ?BOOMING BUSINESS: HOW THREE COUNTRIES ARE PUTTING RENEWABLE ENERGY TO WORK? Clean energy employs an incredible 9.8 million people worldwide. Here’s how three countries – the US, China, and Germany – are making clean energy work at home.? The American renewable industry is growing – and hiring – rapidly. ?According to the US Bureau of Labor Statistics, wind and solar technicians top the list for fastest-growing jobs in America over the next decade. Between 2012 and 2017, solar employment?grew? about 16 percent annually. That’s about nine times faster than the overall US economy! Clean energy jobs tend to pay well. ?Not only is the industry rapidly expanding, it’s giving Americans steady, reliable, and well-paying jobs with a future. Wind turbine technicians and solar panel installers are making a median of $52,260 and $39,240 per year,?respectively, while other jobs such as electrical engineer in the field of renewable energy are making even more—up to $88.50 dollars an hour. Renewable energy industry is booming in states that many may not expect. ?States are investing in clean energy because it makes good economic sense and reduces emissions. Midwestern states?are leading the clean energy revolution: Iowa’s largest utility plans to generate 85 percent of its electricity from wind while Kansas’s utilities are on track to supply over half of the state’s power with wind by 2019. And Texas, alone, hosts more than a quarter of the country’s wind capacity. China invests big in clean energy. ?Yes, China is the world’s biggest country by population – but you might be surprised to learn that it’s also leading the world in the renewable energy investment. That’s right! China is investing more in renewable energy than any other nation on Earth: In 2017, the country invested more than?$44 billion?in clean energy projects. China also accounts for about?60 percent?of global solar cell production, and is the largest wind turbine manufacturer in the world. ? Renewable energy is creating jobs in China, too. ?Thanks to massive investments in renewables and energy efficiency, China has become the world leader in clean energy jobs, with nearly four million employed in 2016. The country aims at creating 13 million clean energy jobs by?2020. Germany is a renewable energy leader. ?Not only has Germany been replacing fossil fuels with wind and solar energy, it’s also the?fifth-largest clean energy employer in the world. An incredible 334,000 Germans work in the renewable energy sector, making the country the largest clean energy employer in the European Union. Renewable energy is shaping new businesses and transforming the job market in Germany. ?With nearly two million jobs belonging to environmentally related fields, the German Federal Environmental Agency?estimates that at least half of those jobs are tied to the?Energiewende. Renewable energy is the fastest growing sector in the US economy, despite Trump's counteractions which are still slowing down renewable development as is Trudeau's ongoing subsidization of the oil and gas sector,?even though?the fossil fuel sector has been losing jobs since 2012. Today, jobs in clean energy become more available and well-paid because, according to European Defence Fund (EDF),?solar energy?supply companies are able to offer more jobs per dollar invested. It develops 12 times faster than the whole US economy. There is good news and bad news when it comes to renewables. The good news is that renewable energy and the jobs associated with it are growing rapidly. The bad news is that the growth is not fast enough to deal with our global warming crisis.? More on the good and bad news as the world attempts to shift away from fossil fuels, but keeps delaying the needed shift, especially in the US and Canada.? While renewables are making great strides in the electricity sector, that segment only represents about a third of the world’s total energy needs. Transportation, industry, and heating make up the other two thirds, and the impact of renewables is much less in those areas than in the energy sector. Unless policy makers address these “blind spots” aggressively, the goal of keeping average global temperatures from rising more than 1.5o C will be out of reach according to a report by?CNBC. “Indeed, their role in heat and transport is often overlooked even though decarbonizing these sectors is a key priority to achieve our long-term climate and sustainability goals,” Birol wrote in the IEA’s 2018 report on renewable energy. He says?renewable energy could grow 25% faster if governments enacted policies and regulations that give companies and investors confidence to invest in clean energy. The U.S. Environmental Protection Agency?rejected Obama-era fuel efficiency standards?and set the stage for a battle with California clean air regulators. 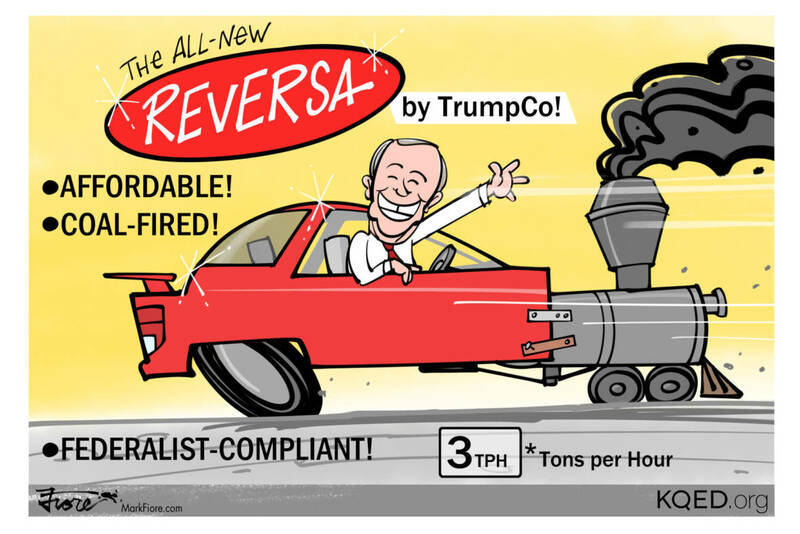 In a reference to the?special exemption that allows California to set tougher emissions standards?than the federal government does, EPA Administrator Scott Pruitt said, "cooperative federalism doesn't mean that one state can dictate standards for the rest of the country."? A new study shows California weather is?set to get even wilder, with more extreme droughts and floods in the state's future. UCLA climate scientists project wetter wets and drier dries as climate change increases California's "weather whiplash." The lead author of the study, Daniel Swain, said, "I can definitely attest to being unnerved by some of our findings." Increasingly extreme weather events could lead to $1 trillion catastrophes. So?this motion, introduced by OneCity councillor Christine Boyle, was a major step forward in this regard. The motion also?talks about incorporating a gendered intersectional lens into climate actions and the city's climate adaptation strategy. The fire on Saturday next to the Kinder Morgan oil depot that is the terminal point of Trans Mountain pipeline?is also ?likely to impact the Burnaby South byelection as it?raises?more concerns about what the increased storage of oil from the expanded pipeline would mean for Burnaby residents. A 2015 report discussed below describes the increased risk. In addition,?the assistant Burnaby fire chief warned that it was lucky that the fire did not occur in the summer because it would be more difficult to deal with the fire. Even in winter conditions, it required 34 firefighters to put the fire out. "I'm glad there were no explosions?because that tank farm?that is just 250 metres from there?is like a bomb waiting to go off in our community," said?Elan Gibson with Burnaby Residents Opposed to Kinder Morgan. On Saturday, a fire broke out in a storage facility at a property owned by a demolition company on Aubrey Street near Pinehurst Drive. ?The facility is surrounded by forest, with a residential neighbourhood on one side and the tank farm on the other. ?It took 34 firefighters to keep the flames from spreading, while the structure was destroyed. "We did have a bit of concern," said?Barry Mawhinney, an assistant fire chief with the Burnaby Fire Department, about the proximity to the tanks, which store a variety of petroleum products. The Trans Mountain Expansion Project?would increase the amount of tanks at the site by 14 and the proximity to one another. In 2016, SFU released?a report?which said the expansion—especially the increase in tanks—poses "significant health and safety risks" to the school and its community. ?The report, prepared by PGL Environmental Consultants, said that the extra tanks and the greater volume of refined bitumen will increase the risk?of accidents, fires and exposure to toxic chemicals. ?It also said the greater number of tanks and their location near the intersection of Burnaby Mountain Parkway and Gaglardi Way could cut off access to and from SFU if there was a fire at the site. Capital spending on industrial chemical industry projects in Canada this year is expected to jump by 65 per cent to $1.9 billion, the highest since $2.2 billion in 2014 and third-highest in a decade, according to a year-end members survey by the Chemistry Industry Association of Canada, which represents producers of 75 per cent of the country's chemical products by value. ?Employment is expected to rise by about four per cent or 640 jobs to 17,670. Provincial and federal government supports, and Ottawa's recent decision to allow a 100 per cent accelerated capital cost allowance for new investments, are being noticed by investors, said Bob Masterson, CEO of the Chemistry Industry Association of Canada.? "Where for most of the last decade the global chemistry community has just bypassed Canada ... now we're back on the radar. We've got the resource, we've got the people and now we're starting to see the favourable investment conditions at the provincial and federal level," he said. If you’ve heard?Bill Nye explain the basics of climate change, you know that greenhouse gases, mainly released by the burning of fossil fuels, are causing the average temperature of our planet to increase. By the end of the century, it could be 4–5?C warmer. So what’s the big deal? ?XKCD?shows how just a few degrees can cause a huge shift. While Google, Microsoft and Facebook?have publicly stated that climate change is a major problem they have at the same time funded a climate change denial conference that claimed increased carbon dioxide atmospheric concentrations has a negligible affect on weather, correlates with wealth (which it may as the wealthiest nations tend to be the biggest per capita carbon dioxide producers)?and increases life expectancy. As expected,?the Kochs and Mercers who were major Trump contributors, also funded the conference. The tech firms see the libertarian climate change deniers as supporters in their fight against government regulation. All three tech companies were sponsors of?LibertyCon, the annual convention of the libertarian group Students for Liberty, which took place in Washington, DC. Google was a platinum sponsor, ponying up $25,000, and Facebook and Microsoft each contributed $10,000 as gold sponsors. The donations put the tech companies in the top tier of the event’s backers. But the donations also put the firms in company with some of the event’s other sponsors, which included three groups known for their work attacking climate change science and trying to undermine efforts to reduce carbon emissions. Among the most notable was the?CO2 Coalition, a group founded in 2015 to spread the “good news” about a greenhouse gas whose increase in the atmosphere is linked to potentially catastrophic climate change. The coalition is?funded by conservative foundations?that have backed other climate change denial efforts. These include the Mercer Family Foundation, which in recent years has?donated hundreds of thousands of dollars?to right-wing think tanks engaged in climate change denialism, and the Charles Koch Institute, the charitable arm of one of the brothers behind Koch Industries, the oil and gas behemoth. The presence of the tech sponsors at a libertarian conference is not itself unusual, as governments around the globe move to try to regulate social media and online privacy. Tech companies see libertarians as natural allies in the fight against regulation. ?Indeed, Google sponsored two different sessions at the conference, one on why “permissionless innovation” needs to be defended and another on whether the government will “continue to let the Internet be awesome.” But the companies’ underwriting of a conference with a climate denier on the schedule shows the hazards of trying to advance a policy agenda through interest groups without also supporting their fringe elements. The devastating (wildfire)?season saw an area go up in flames in B.C. that was seven to 11 times larger than what would be expected without human influence on the climate, according to scientists at Environment and Climate Change Canada (ECCC) and the University of Victoria (UVic).? The 2017 wildfires burned up over 12,000 square kilometres, forcing 65,000 people from their homes, exposing millions to harmful smoke-filled air and plunging the province into a state of emergency for months. ?It was the most disastrous fire in recent memory,?breaking records?going back six decades — until 2018 brought?even larger?wildfires. ECCC and UVic researchers have now completed a study showing how anthropogenic, or human-caused,?climate change dramatically increased the risk of wildfires in Canada’s westernmost province. The study showed that humanity’s effect on the climate increased the area burned in 2017 by a factor of seven to 11. The subject of the massive increase in forest fires has been a preoccupation for Canadian scientists, who have found that?roughly four million hectares?of land were affected by forest fires in Canada over the three years to 2016, well above the long-term average. In May 2016, a terrifying wildfire swept through Fort McMurray, Alberta, forcing an evacuation of at least 88,000 people,?the largest in Alberta history?and destroying at least $3.7 billion worth of property,?more than twice the amount?of the previous natural disaster on record. The researchers gathered a large body of regional climate model simulations to compare two scenarios, one involving human influence on the climate and one without, using the decade 2011-2020 to represent the current climate and 1961-1970 to represent an alternative climate with reduced human influence. ?They then demonstrated the risk factors connected with the wildfire season and the area burned, and found that the maximum temperature anomalies that were observed are over 95 per cent likely to be due to anthropogenic factors. Montg In dollar terms it is way cheaper for the electricity. A-24 I live in a community without proper bus service so my wife and I still need a vehicle to live in this society. I have no idea how my vehicle would handle -40 below however? -10? is just fine and it handles really well in the snow.? I am tired of the false dichotomies so I will use one of my own. Until you stop NATO forces from their consumption don't talk to me about personal sacrifice. A couple of hours of flight time over the Ukraine is far more significant than any form of land vehicle I could chose even a Hummer. If we grounded NATO's air force except for required training and intercepting any real threats and reduced the armaments being built we might have a chance to save the planet. What are you doing to stop NATO is the best question to ask people who claim to want to reduce emissions globally. I have no idea how my vehicle would handle -40 below however? -10? is just fine and it handles really well in the snow.? I am tired of the false dichotomies so I will use one of my own. Until you stop NATO forces from their consumption don't talk to me about personal sacrifice. A couple of hours of flight time over the Ukraine is far more significant than any form of land vehicle I could chose even a Hummer. If we grounded NATO's air force except for required training and intercepting any real threats and reduced the armaments being built we might have a chance to save the planet. What are you doing to stop NATO is the best question to ask people who claim to want to reduce emissions globally. Nato's air force isn't significant consumption compared to private vehicles on our roaads. That's got to be the worst reason for grounding Nato I've heard yet! ?